A Closer Look at our Community: The Fine Art of Mark Oberndorf - Opens December 17, 2014 ~ The History Girl! A new exhibit entitled A Closer Look at our Community: The Fine Art of Mark Oberndorf opens Wednesday December 17, 2014 in Lambert Castle (home of the Passaic County Historical Society) at 3 Valley Road, Paterson, NJ. The exhibit will remain open until Sunday March 29, 2015. This exhibit focuses on the sights of our local community, as shown in the paintings of Bergen County resident and artist Mark Oberndorf. Oberndorf’s work focuses on the views of local buildings and features within our neighborhoods. Many pieces included in A Closer Look at our Community feature Passaic County, while others portray subjects from a wider geographic area. Some subjects include restaurant signs, barber shops, private homes, and fire stations. Through his work, Oberndorf demonstrates what is beautiful, interesting and quirky in our communities. Through this exhibition visitors will be able to see their environment in a different perspective. Visitors can access the exhibition during regular museum hours (Wednesday - Sunday). General museum admissions apply. Meet the artist at the exhibit reception held at Lambert Castle on Wednesday January 14, 2015 from 7:00 - 9:00 pm. The reception is free for members; for all others regular admission applies. 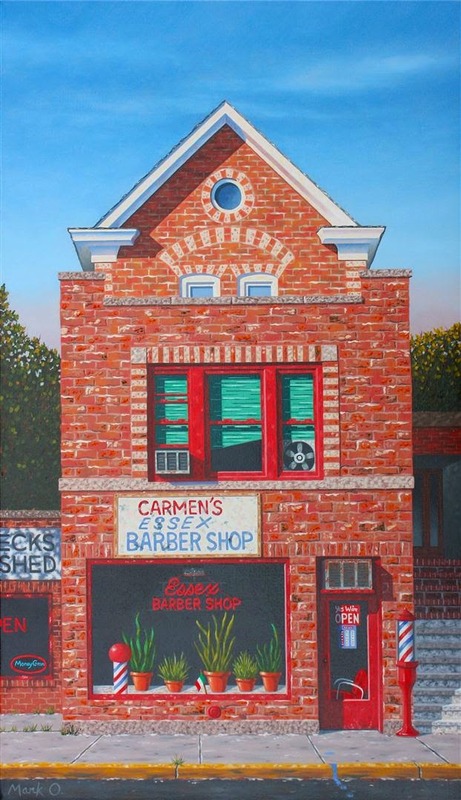 *Painting: Carmen’s, Hackensack, NJ by Mark Oberndorf. Provided by the Passaic County Historical Society.